Renovated in 2007, Gallery Hotel SIS in Prague is a modern and simply decorated building with a 19th-century facade. The hotel sits four tram stops from historic Wenceslas Square, the center of the business and cultural communities in the New Town. 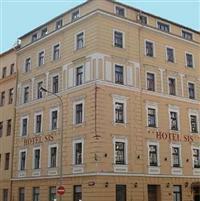 The hotel is also 15 minutes by taxi from Mala Strana, Prague Castle and Charles Street. Ruzyne Airport is situated 16 kilometers away, with an approximate driving time of 25 minutes. Guests at the Gallery Hotel SIS can start the day with buffet breakfasts or enjoy drinks in the lobby bar. Complimentary newspapers can be found in the lounge area, and guests can also unwind in the sauna. The hotel staff is available 24 hours a day to assist guests with local information, reserving conference rooms and other hotel facilities. Safe-deposit boxes can be found at the front desk, and guests with cars will find allocated parking spaces in a nearby garage. There is a free Internet point in the lobby. The Gallery Hotel SIS features contemporary furnishings in light wood and soft colors decorate the 40 guestrooms, all of which have minibars, satellite television, and wireless Internet access.